It is a pleasant and lovely plastic keychain. 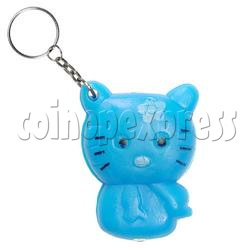 The key chain's body is made of soft plastic. There are a white light bulb with two 3v-LR1130 button cells. Light can be ON or OFF immediately by pressing the button inside of the body. Minimum order quantity: 1800 pieces. Custom Design Is Welcome And Minimum Order Quantity Needed Is 4800pcs. 12pcs keyrings packed in a white plastic box. 900pcs packed in one outer carton, carton size: W360 x D440 x H70 mm, total 2 cartons for 1800 pieces order.